The keys are large, with a concave form that gives them a pleasant response. The keyboard comes with 3 convenient buttons located next to the Escape button. 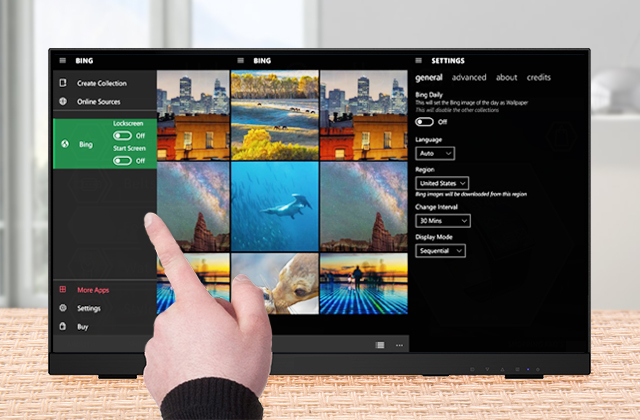 They will allow you to seamlessly switch between a computer, a phone, or a tablet and continue typing on the newly selected device without any interactions. The arrow keys are a tad too small for our taste. The Logitech K780 is easily the best Bluetooth keyboard for people who don't just use a keyboard with their desktop PC but also with a tablet or a phone. 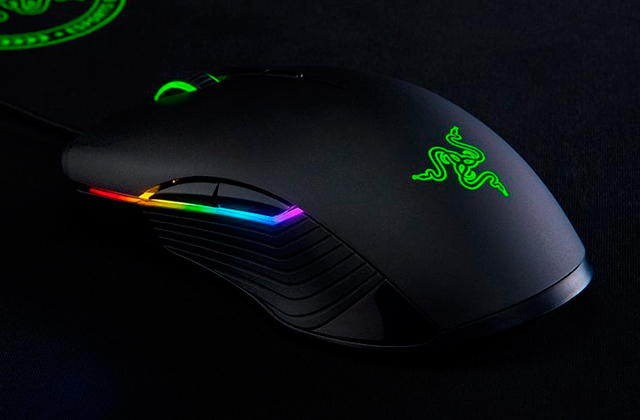 While the majority of these wireless peripherals tend to sacrifice certain aspects in favour of mobility, the model in question is a full-fledged keyboard and we like it for it. 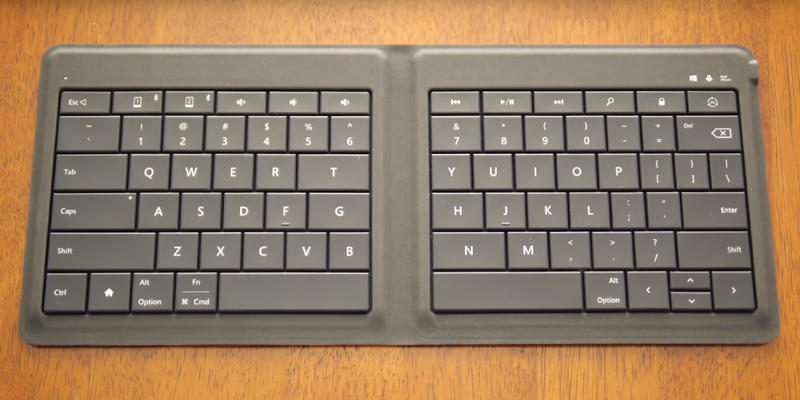 This Bluetooth keyboard is not only ultra-thin, but also foldable and spill-resistant. You can actually pair it with two devices at a time. You may need some time to learn how to switch between two devices. 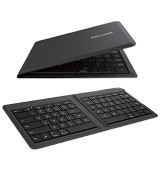 Expensive, but high-quality wireless Bluetooth keyboard, compatible with two devices for higher performance. With the device's rechargeable battery, you won't have to waste your money on normal, alkaline batteries. The keyboard works both as a screen protector and a viewing stand. The built-in hinges will allow you to explore a variety of different angles, up to 130 degrees. You'll have to get used to the specific positioning of certain keys. 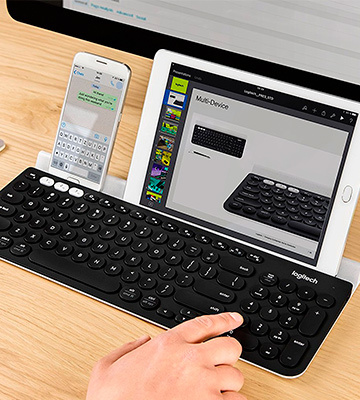 If you really like your iPad but you would prefer to be able to properly work on it, you should definitely give this Bluetooth keyboard a shot. It won't detract from the stunning look of the iPad but it will fix its shortcomings in the typing department. An OFF/ON switch, a smart sleep mode, and the model's low lower consumption technology allow this device to work for up to 2 years without changing the batteries. The spill-resistant housing will further extend the service life of this product. The signs on the keys wear off after some time. 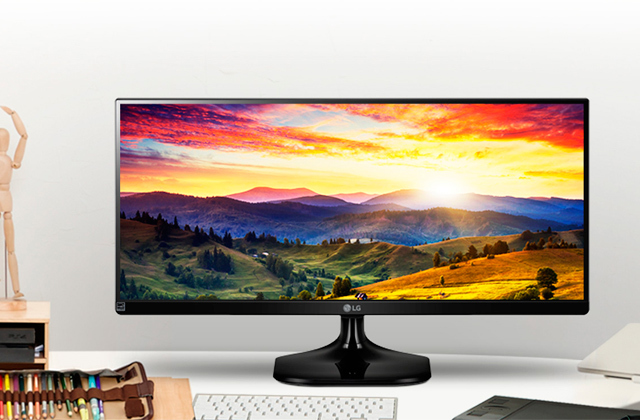 TheTeckNet X315 is one of the most impressive options in its price range. 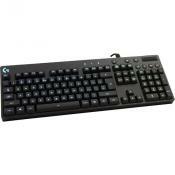 For about 10 pounds, you'll get yourself a fully functional and reliable wireless keyboard with a solid signal range. The classic layout is familiar to the absolute majority of people, so you'll get used to it in no time. The LED battery indicator light on the bottom of the keyboard will let you know when to change the batteries. The scissor-switch mechanism is even quieter than the typical membrane keyboard and the keys require noticeably less force to press, giving it a sort of faux mechanical feel. 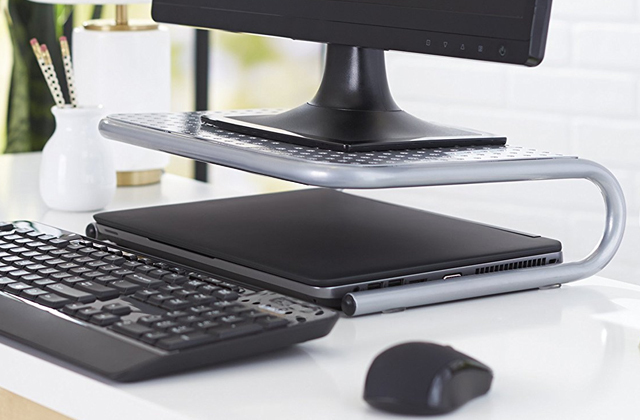 The versatility of this wireless keyboard is its biggest strength. You can use it with any of the major operating systems. Its compact size will not take away too much of your workspace. Plus, it doesn't cost a whole lot, which is always nice. 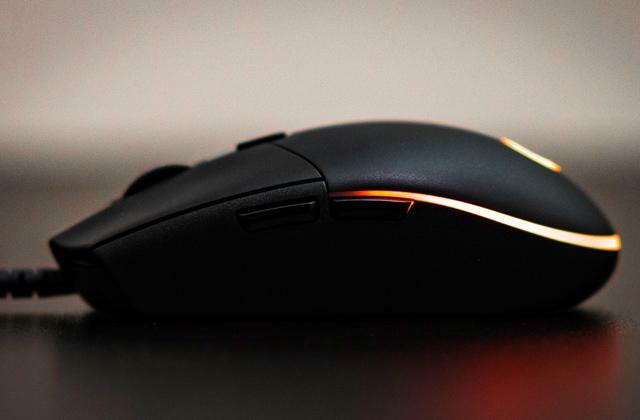 Logitech isn't just one of the biggest juggernaut in the computer peripherals scene but also the kind of company that was never afraid to try out new things and explore different options. So it comes as no surprise that they were one of the first companies to introduce the so-called "easy-switch" solution. With this Bluetooth keyboard, it comes in a form of three convenient buttons located next to the Escape button. Using these buttons, you will be able to seamlessly switch between a desktop PC or laptop, a phone, and a tablet and continue typing on the newly selected device without any interactions. And given that the keyboard is compatible with just about any major operating system, including Windows, Mac, Android, and iOS, you won't be limited in your gadget options. That said, it isn't always as comfortable using a keyboard with a phone or a tablet, but as per usual, the engineers at Logitech have thought things through and incorporated a particularly convenient phone/tablet stand. 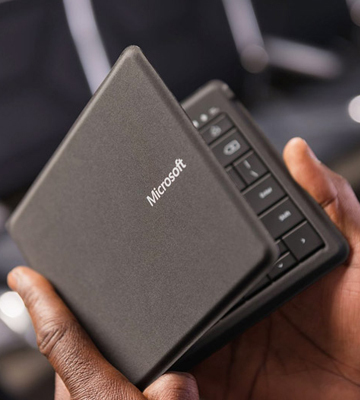 It doesn't visibly increase the size of the keyboard but it is capable of holding a variety of different gadgets securely in place. This way, you'll be able to position your smartphone or your iPad Pro at just the right angle, perfect for reading and typing. 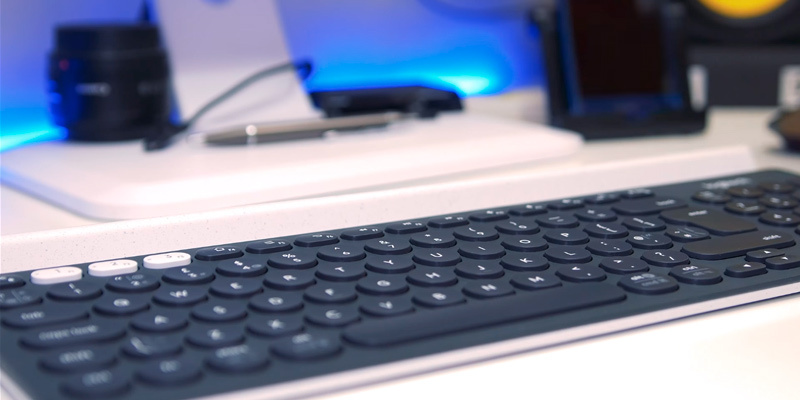 The rubber cradle and the multi-device functionality are definitely the most discerning characteristics of this Bluetooth keyboard. But they aren't the only ones worth mentioning. 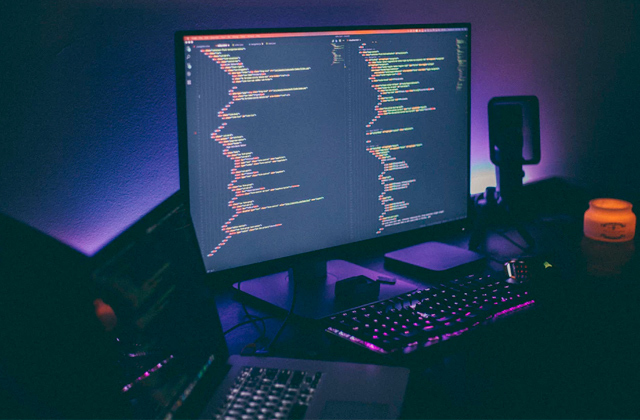 For example, unlike most wireless keyboards, it comes with a numeric pad, a part of the keyboard that a lot of people rely on in their work life. All in all, the model features the sort of full-size layout that is familiar to anyone who has ever used a standard keyboard before. The keys are large, with a concave form that gives them a pleasant response. Though it is being advertised as a Bluetooth keyboard, you won't have to rely on the said technology if you don't want to. Instead, you can use the Logitech Unifying™ USB 2.4GHz receiver for easy wireless connection. The keyboard will be able to get 2 years of service life out of a couple AAA batteries, which is nothing short of impressive. Not dissimilar to the majority of wireless keyboards, what we have here is a membrane peripheral. And while they do have their disadvantages, one thing you cannot take away from them is their virtually silent operation. With this product, you can type away all you want and it shouldn't annoy you or the people around you. All things considered, the Logitech K780 is easily the best Bluetooth keyboard for people who don't just use a keyboard with their desktop PC but also with a tablet or a phone. 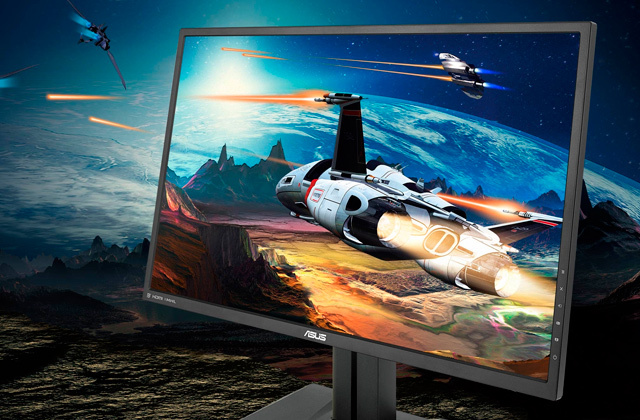 While the majority of these wireless peripherals tend to sacrifice certain aspects in favour of mobility, the model in question is a full-fledged keyboard and we like it for it. 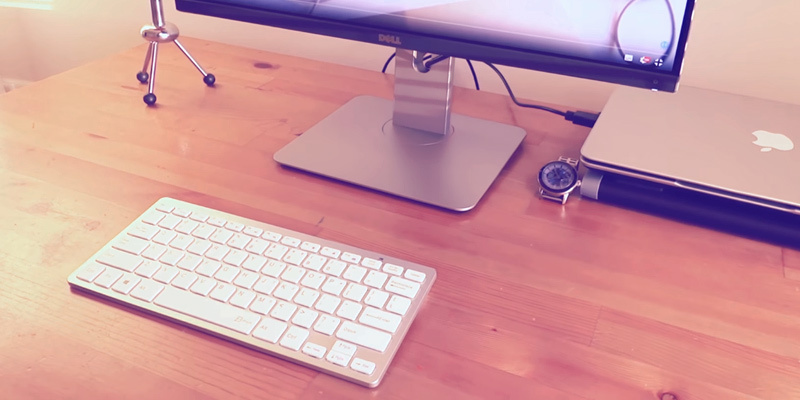 This Bluetooth wireless keyboard is lightweight and compact, and hence, portable. Whenever you need to go on a trip, just pack it in the bag and use on the way. To start using the keyboard, all you need to do is to fold it up. The keys are very sensitive so that typing is going to be fast and accurate. You wouldn't need to press the keys hard to get the respond. 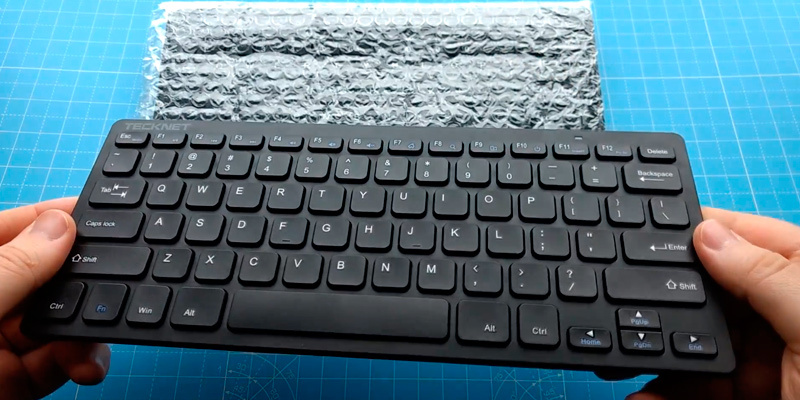 The other prominent advantage of Microsoft GU5-00001 Bluetooth keyboard is its water-proof design. If you've happened to spill over the water, the keyboard will not get screwed up. With no shade of a doubt, it's a leading keyboard on sale. Once fully charged, the battery life will last for about 3 months, that's quite a lot for continuous operation. When the battery runs out flat, connect it to a micro-USB so it's charged for the next use. 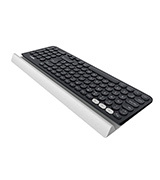 Microsoft GU5-00001 Bluetooth keyboard can become a great solution for those users who'd like to use it with various gadgets such as iPad, iPhone, Android as well as Windows-driven phones and tablets. 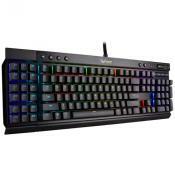 Full-size set of keys and multimedia controls make this keyboard extremely convenient to work with. 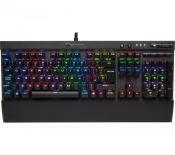 Upon using this keyboard, watching the videos from YouTube and other video streaming websites is going to be a snap. The keys are assigned to the following actions - "Play", "Stop", "Forward", "Backward" and "Pause". 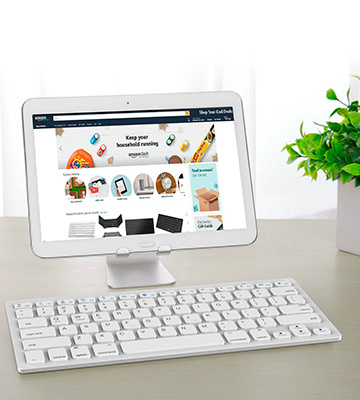 If you're looking for a universal wireless keyboard with enhanced conveniences, this product should fit you well. The Arteck HB065 has a very specific target audience in mind. It isn't the most versatile keyboard nor is it the kind of keyboard that the absolute majority of customers would be comfortable with. This model works best with Apple products. Or, to be more precise, with the fifth and sixth iteration of iPad as well as iPad Air. 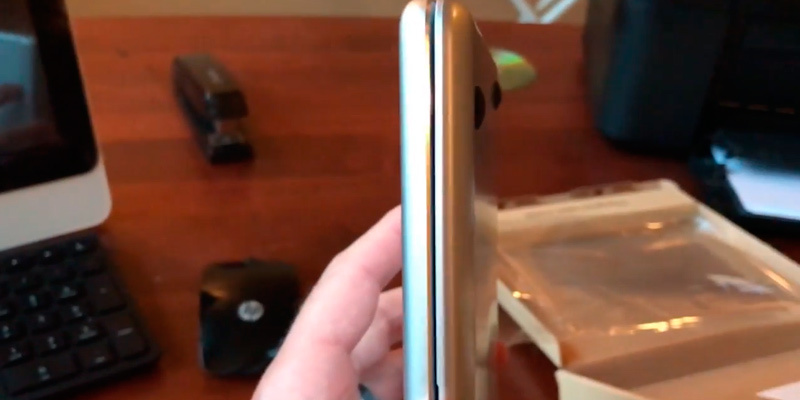 Of course, that doesn't mean that you won't be able to use the magnet hinge-slot with other tablets but, since it was specifically designed for iPads, there'a real chance your Android tablet or smartphone won't fit the slot. That said, if you do have an iPad, this thing will prove to be a blessing in no disguise. 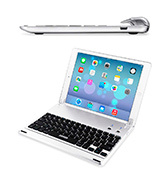 Though it is a Bluetooth keyboard first and foremost, the device doubles as a viewing stand and a screen protector. Just put your tablet into the slot and let the powerful magnets do their job. 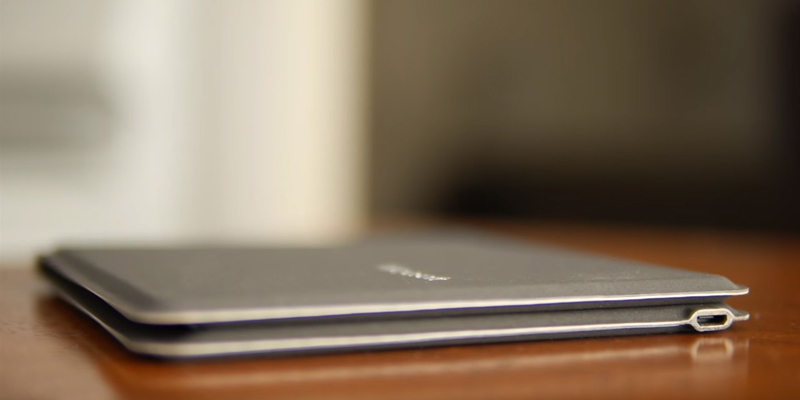 This way, you'll be able to turn your tablet into a proper laptop. Plus, the built-in hinges will allow you to explore a variety of different angles, up to 130 degrees. They will let you use the keyboard as a protective cover. And, naturally, they will also provide you with the opportunity to enjoy the most comfortable and convenient viewing or typing position. A lot of people enjoy the thin, lightweight design style of 9.7-inch iPads and this wireless keyboard perfectly complements that style. 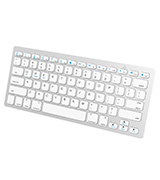 The white palette and other visual similarities aside, the keyboard also uses a standard Mac format keyboard layout. Sure, there's no numpad here, but the large size of the keys provides the sort of familiar and comfortable typing experience that will satisfy both the inexperienced users and the longtime Apple customers. As for the power source, the model comes equipped with a built-in rechargeable battery. Obviously, it won't give you the same battery life as those keyboards that rely on external alkaline batteries. But you won't have to waste your time and money on these batteries either, which is always a good thing. Furthermore, the one that the keyboard does include will give you a hundred hours of battery life and it'll only take you 2 hours to fully charge it. And the standard battery indicator light will notify you when to charge the battery, so you won't be caught off guard. Other than that, there isn't much to say here. 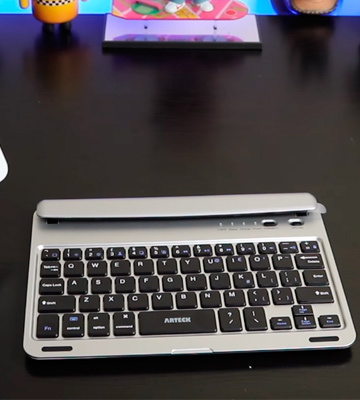 If you really like your iPad but you would prefer to be able to properly work on it, you should definitely give this Bluetooth keyboard a shot. It won't detract from the stunning look of the iPad but it will fix its shortcomings in the typing department. The TeckNet X315 is one of the most affordable Bluetooth keyboards that we've found but we actually like it quite a lot. 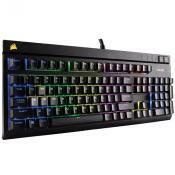 Generally speaking, for this sort of price, you won't get anything but a basic keyboard, with no discerning features. But that isn't the case here. 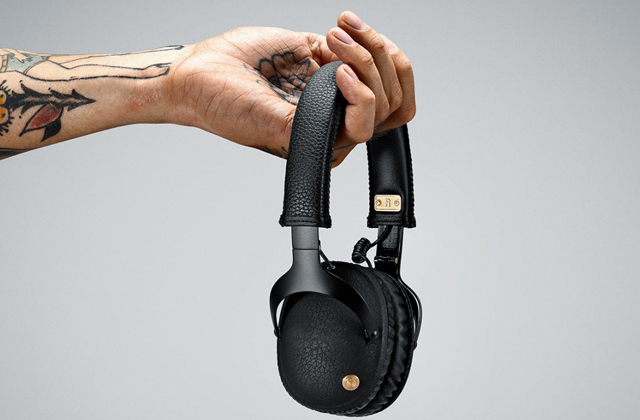 For starters, the model comes equipped with Co-Link, a particularly useful connection recognition technology. 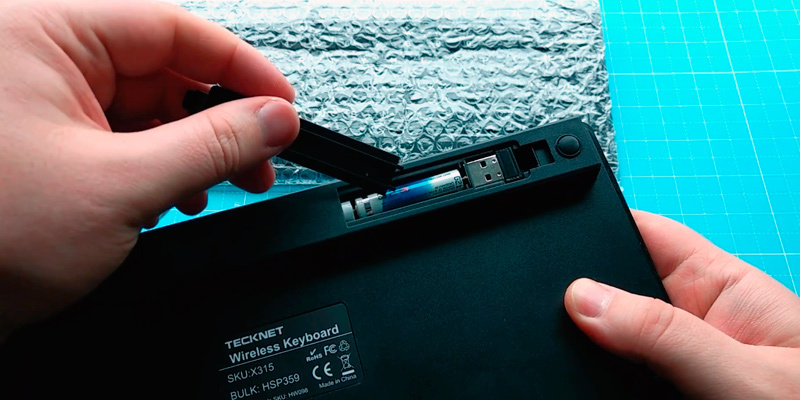 Once you've paired the keyboard with your computer, you won't have to re-establish that connection after shutting the PC down or in case of signal loss. 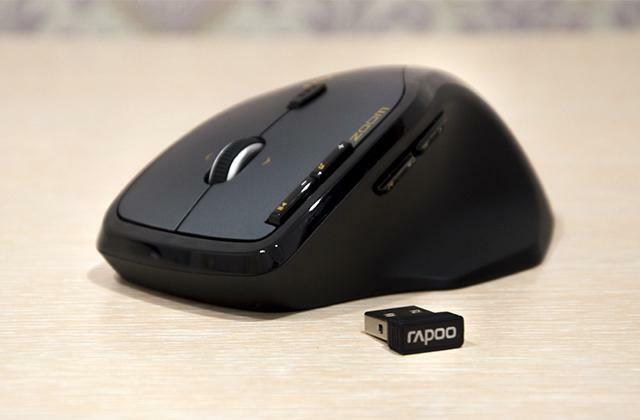 Speaking of pairing, the product comes with a USB 2.4GHz receiver, which is really convenient for PC users since most desktop computers do not have a Bluetooth receiver. As the receiver stands in place, the keyboard will be always ready for use. And, with its 10-metre range, you will be able to enjoy all of the advantages of a truly wireless connection. Put it on a table beside your sofa and control your computer from a position of comfort. 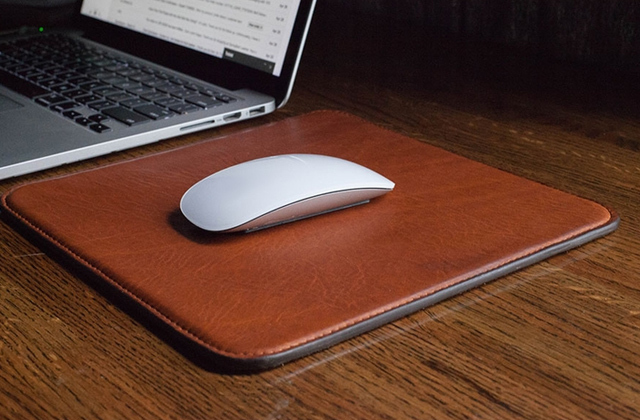 While wireless keyboards are inherently better than standard keyboards when it comes to uncluttering your workplace, the super-slim profile of this model that is just 5-mm thin allows this peripheral device to be particularly good at that. Since it won't take too much of your space, you'll be free to use that space for literally anything else, and that's always a plus. 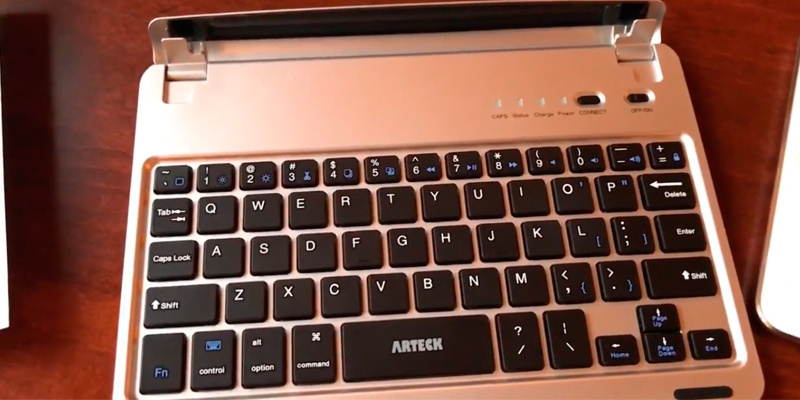 The keyboard runs on a couple of triple-A batteries, which some people may see as a disadvantage as you will have to replace those batteries once they run out of charge. But they won't have to do that quite as often as these people might think. An OFF/ON switch, a smart sleep mode, and the model's lower consumption technology allow this device to work for up to 2 years without changing the batteries. Most individuals will take for granted whisper-quiet nature of the keys as this is a membrane keyboard. But they wouldn't be wise to use that mindset towards the spill-resistant composition of this keyboard. Sure, it isn't a unique characteristic, but it is quite impressive considering the particularly modest price that the model comes with. Finally, the easily accessible hotkeys will allow you to change the volume, mute, or skip a song without relying on your mouse. In conclusion, the TeckNet X315 is one of the most impressive Bluetooth keyboards in its price range. 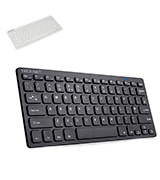 For about 10 pounds, you'll get yourself a fully functional and reliable wireless keyboard with a solid signal range. The classic layout is familiar to the absolute majority of people, so you'll get used to it in no time. The people behind the JETech 2156 advertise this product as a universal keyboard. And "universal" would be as good of a word as any to describe it. 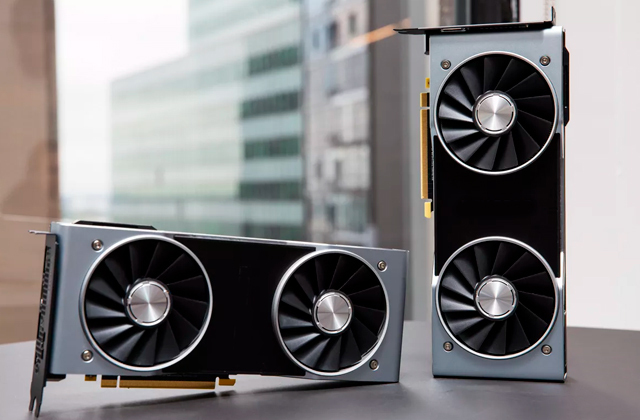 The model works with Windows, Mac, Android, and iOS, so there's no shortage of customers who could put this device to good use. Furthermore, it comes with shortcut keys for all four of these systems, a nice little touch that will further improve your interactions with both devices. Now, we're not saying that the folk at JETech are entirely honest with their advertising tactics. For instance, they claim that the model boasts a super long battery life. But even with the power-saving mode, you wouldn't be able to get more than 3 months out of this thing before having to change the batteries. 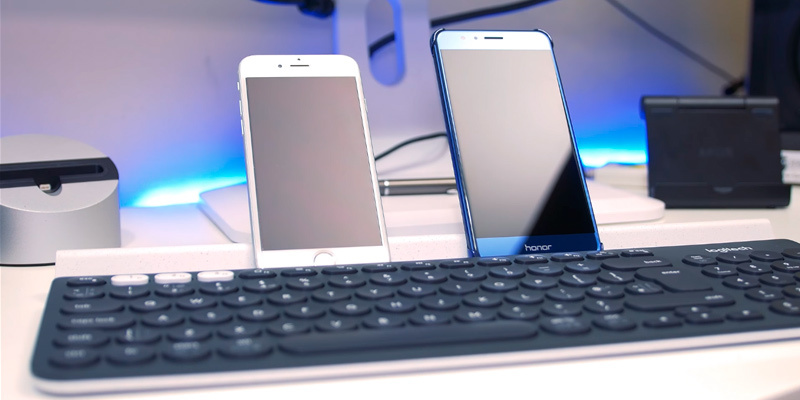 Now, three months is not too bad, but we've seen plenty of keyboards do better than that. Speaking of batteries, the Bluetooth keyboard runs on a couple of AAA batteries. Unfortunately, the batteries are not included in the package. But they don't cost a whole lot and you can buy them in any convenience shop, so that's not that much of an issue. The only thing you will receive with the keyboard is an instruction manual, an always welcome addition even though you probably won't need it. As far as the keyboard's design is concerned, we were more satisfied than not. It looks sleek and neat, with white buttons and grey-ish housing. On the bottom, you will find a Bluetooth connection switch, a Power button, and a battery compartment. On the front, aside from the standard layout, there's an LED battery indicator light. With 28.4 x 11.9 x 1.8 centimetres in overall dimensions, the model is quite compact and more than portable. Aside from the seldom useful numpad, all of the buttons and the functions of a standard keyboard are there but it is a lot less clunky than those keyboards. By the way, the said buttons are controlled by the so-called "scissor-switch mechanism". Now, we're not saying that you will definitely feel a difference between this and your average membrane panel. But plenty of customers report that it is even quieter than the typical membrane keyboard and the keys require noticeably less force to press, giving it a sort of faux mechanical feel. Other than that, this is an English QWERTY keyboard, but with a US keymap. There isn't that much of a difference between the US and UK layout, but you will have to get used to certain symbols being in different places. 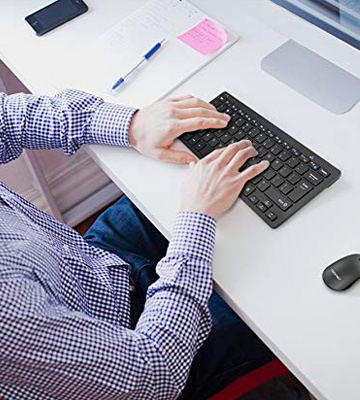 All in all, the versatility of this wireless keyboard is its biggest strength. You can use it with any of the major operating systems. Its compact size will not take away too much of your workspace. Plus, it doesn't cost a whole lot, which is always nice. It's hard to imagine our life without digital devices. People use gadgets every day and everywhere - smartphones, tablets, PCs, netbooks and more. The smartphone is perhaps one of the most popular, used for making calls, playing games, viewing pictures, as well as working with documents, typing and using social networks. The beauty about Bluetooth keyboards is that you won't be bound to using it only with a PC. 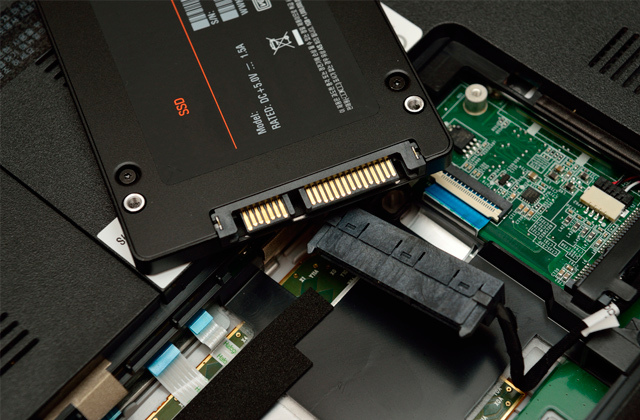 In most cases, they are compatible with all popular digital gadgets. If you do need to actively use a keyboard, but don't intend to stick to the PC, a Bluetooth keyboard is definitely what you need. You can connect your Bluetooth keyboard to a wide variety of devices. If you're an owner of a Chromebox or Chromebook, Gaming Laptops, Ultrabooks, Touchscreen Laptops, etc. 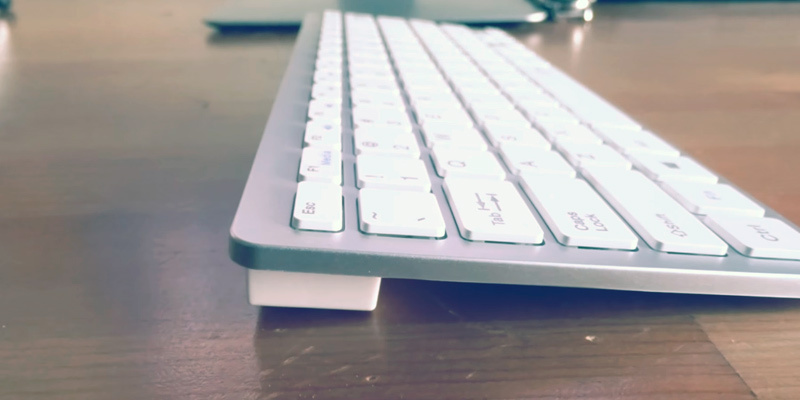 you will certainly benefit from having a wireless keyboard. When choosing a keyboard, it's important to consider its compatibility. Depending on the gadget you use, consider connectivity options and make sure the chosen keyboard is going to work. Talking about the thing like a wireless keyboard, Ergonomics is surely important. It should not be bulky just as well as it shouldn't be flimsy. Most keyboards are made of plastic. They are not as expensive as those wrapped in an aluminum housing, yet, they are frequently purchased worldwide. The keyboards made of the aluminum alloy are more durable and scratch-resistant. You can freely move them around and worry not about their quick wear. There are also some keyboards covered with a coating pleasant to the touch. When compared to most other products, they are smoother and more comfortable to use. 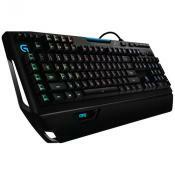 The market has also been introduced to the new cutting-edge wireless keyboards, projected on the table by a laser. For the reason most keyboards are small in size, people often bring them around and use in public places. This is where their Battery Life plays an important role. The first thing that directly affects the battery life is a power source that a keyboard uses. Most wireless keyboards are powered with AAA or AA batteries, their battery life often lasts for up to 2 years. There are also keyboards, powered with the Li-ion rechargeable batteries. The only obvious downside of such keyboards is that they often require recharging. In the attempt to attract a bigger number of consumers, manufacturers provide a variety of Extras, aimed to appeal in this or that way. You can find spill-resistant, water-resistant, foldable and compact keyboards. Some keyboards have got slots for smartphones and tablets, others are capable of projecting the keyboard on a table. A choice is truly vast, so it's up to you what to buy.